Vernon D Roberts, age 86, passed away peacefully on Friday April 5, 2019. Vern was born at a ranch house south of Catarina Texas on October 15, 1932. Vern is preceded in death by his parents, Clifford James and Kate Taylor Roberts. He was also preceded in death by his sister, Berel “Happy” Barta and his brother Lawrence Roberts. Vern lost his beloved wife, Shirly Roberts, on May 27th, 2017. Vern and Shirly were married for over 64 years. Vern is survived by his son, Chuck Roberts, his daughter, Kathy Wagner, his daughter-in-law, Leann Roberts, his son-in-law, Leland Wagner, his four grandchildren, Jeremy Barba, Stephanie Barba, Sharla Oliver, and Andrea Roberts, and six great-grandchildren. Vern grew up on a very large cattle ranch, over 250,000 acres, in south Texas. He attended high school in Catarina Texas where he loved his car and playing football. Vern joined the United States Air Force in 1949. During his time in the military, Vern had the opportunity to attend the FBI training school and to travel to many military bases all over the world. He served in the Korean conflict. The lessons he learned during his time in the military served him well all through his life as well as during his service in the military police in the US Air Force. Vern was honorably discharged from the Air Force after sustaining an injury in the line of duty. During his recovery at Fitzsimons Army Medical Center in Colorado he met Shirly Anne McGivney. 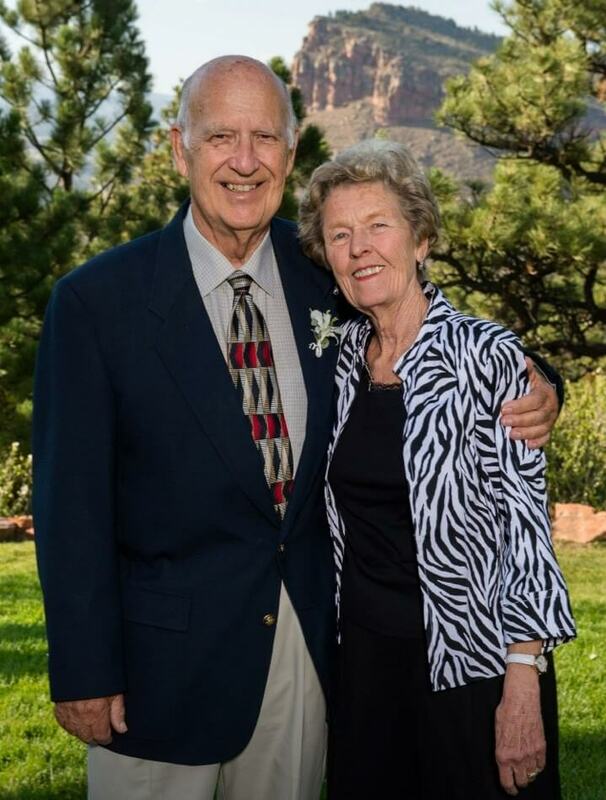 They met in June of 1952 and were married in Denver on October 25, 1952. They lived most of their married life in Denver, Colorado and Plano, Texas. They moved back to Littleton Colorado in August 2015 to be near their children, grandchildren and great grandchildren after many years away. Vern was a very loving husband and father. He was very committed to building a better life and providing new opportunities for his family that he did not have as a child. Vern loved his work throughout his life. Starting at age 12, Vern worked for room and board at the general store in Carizo Springs, Texas. He held a wide variety of jobs both before and after his military service. After his military service, Vern completed his education and worked for many years as an insurance executive. He owned his own insurance agency for over 10 years. Given his love of travel, Vern greatly enjoyed his time with a corporate travel agency where he planned and conducted sales award conventions all over the world. Many of these conventions were in Hawaii. Vern and Shirly loved Hawaii and visited Hawaii over 20 times in their lives together. Vern worked until the age of 83. His final job was as a school bus driver in Frisco Texas. He always loved to drive! Vern was a strong person with strongly held opinions. He was also endlessly committed to his family and friends and would do anything in his power for the ones he loved. He was a teacher for many of us and he taught us love in his way. If you were fortunate enough to know him and have him as part of your life, you know he will be missed tremendously. There will be a military service in Vern’s honor at Ft Logan National Cemetery on Friday April 19th, 2019 at noon. If you choose to attend, please meet at staging area A by 11:40am. Any flowers are requested to be sent to Horan & McConaty at 3101 S. Wadsworth Blvd., Lakewood, CO 80227. If you prefer to make a charitable donation, contributions to the Humane Society would be greatly appreciated as a way of honoring Vern and Shirly’s love of dogs. I’m so grateful for the friendship Vern and Shirly provided my parents, and for the fun times we had between the two families – holidays and vacations. Such beautiful memories for me. Rest in peace, Vern. I was so sorry to hear when your mother passed, and am sad to hear of your father’s passing. So many bright memories of younger days with my family and yours that I’ll always remember fondly.